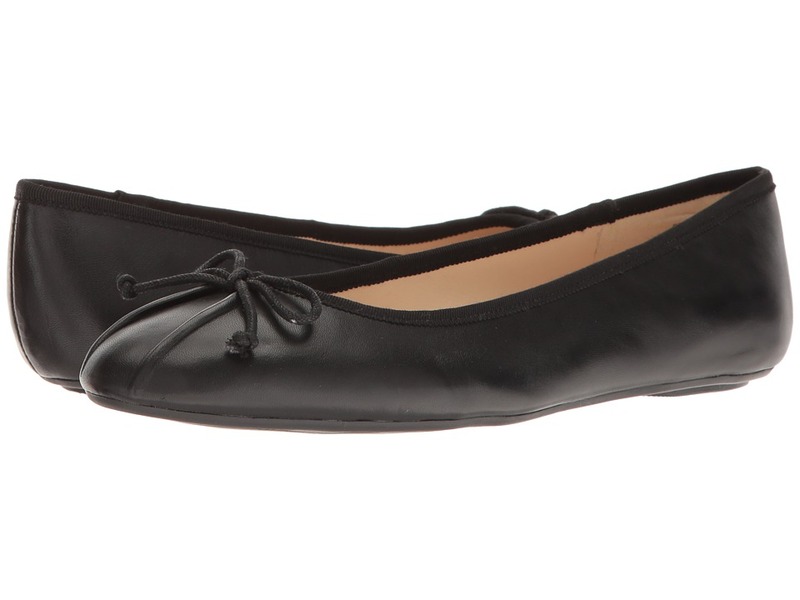 The Nine West Batoka flat offers a timeless design with contemporary appeal. Suede or leather and textile upper. Slip-on design. Round toe. Bow detail at toe. Man-made lining. Lightly padded footbed. Man-made outsole. Imported. Measurements: Weight: 4 oz Product measurements were taken using size 7.5, width M. Please note that measurements may vary by size. Weight of footwear is based on a single item, not a pair. 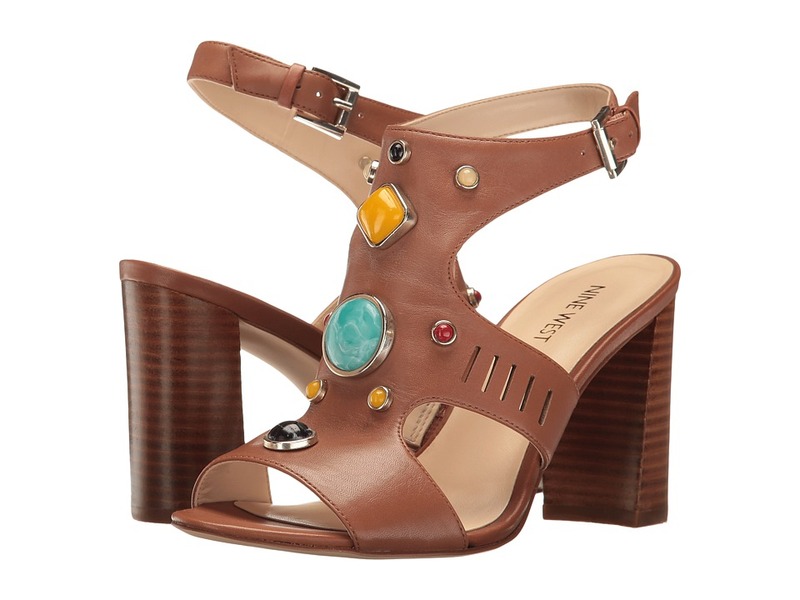 Update your chic festival ensemble with the Nine West Chervil sandal. Leather or nubuck upper. Slingback ankle strap with buckle closure. Open toe. Jeweled embellishments along vamp. Man-made lining. Lightly padded footbed. Block heel. Man-made sole. Imported. Measurements: Heel Height: 3 1 2 in Weight: 10 oz Product measurements were taken using size 8.5, width M. Please note that measurements may vary by size. Weight of footwear is based on a single item, not a pair. Captivate an audience with the stunning Nine West Dempsey sandal. Available in a variety of upper materials. Ankle strap with buckle closure. Open toe. Single strap over vamp. Man-made lining. Lightly padded footbed. Wrapped platform and block heel. Man-made outsole. Imported. Measurements: Heel Height: 3 3 4 in Weight: 11 oz Platform Height: 3 4 in Product measurements were taken using size 8.5, width M. Please note that measurements may vary by size. Weight of footwear is based on a single item, not a pair. 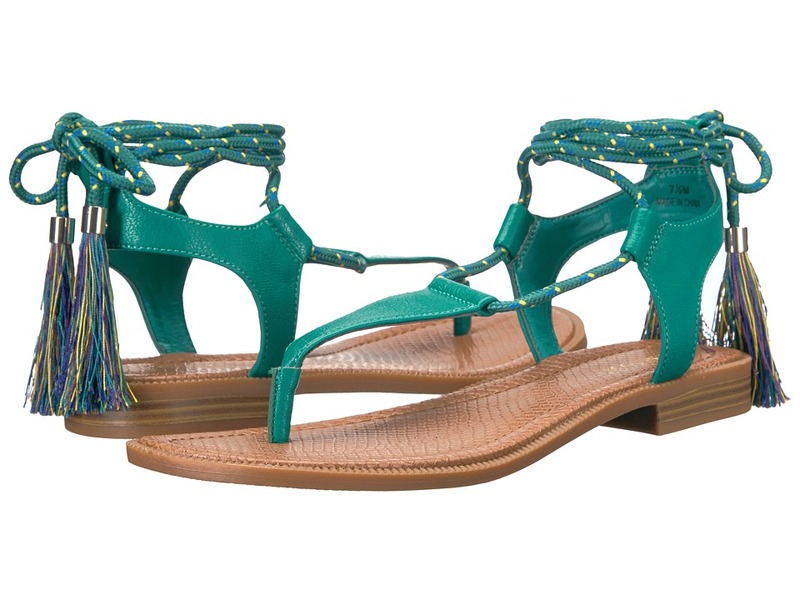 Create the perfect festival-ready ensemble with the boho-chic Nine West Devar sandal. Suede upper. Back zippered closure. Open toe. Studded and laser-cut embellishments. Man-made lining. Lightly padded footbed. Man-made outsole. Imported. Measurements: Heel Height: 1 4 in Weight: 6 oz Product measurements were taken using size 9, width M. Please note that measurements may vary by size. Weight of footwear is based on a single item, not a pair. 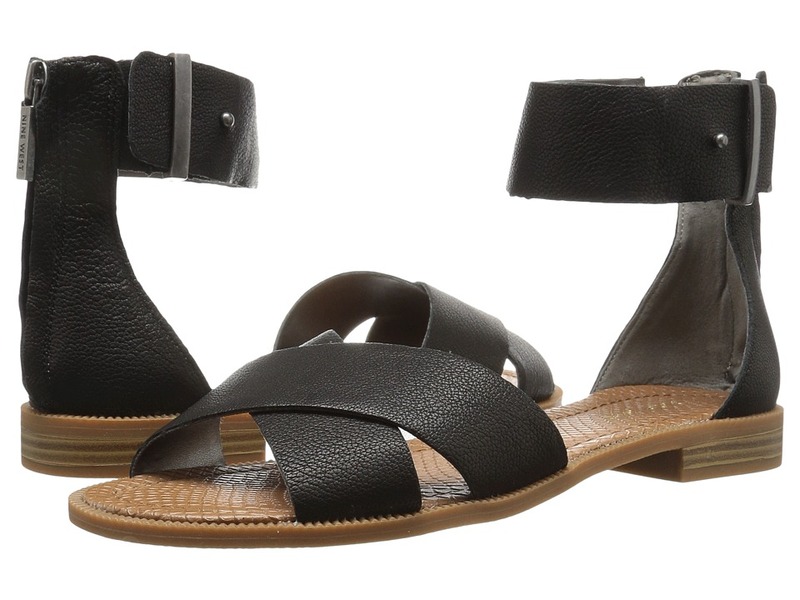 Modernize any timeless ensemble with the Nine West Fields sandal. Leather or suede upper. Ankle strap with buckle closure. Open toe. Single strap over vamp. Man-made lining. Lightly padded footbed. Wrapped block heel. Man-made outsole. Imported. Measurements: Heel Height: 2 1 4 in Weight: 10 oz Product measurements were taken using size 8.5, width M. Please note that measurements may vary by size. Weight of footwear is based on a single item, not a pair. Keep your trendsetting look elevated with the Nine West Flownder espadrille wedge sandal. Available in a variety of upper materials. Ankle strap with buckle closure. Open toe. Single strap over vamp. Man-made lining. Lightly padded footbed. 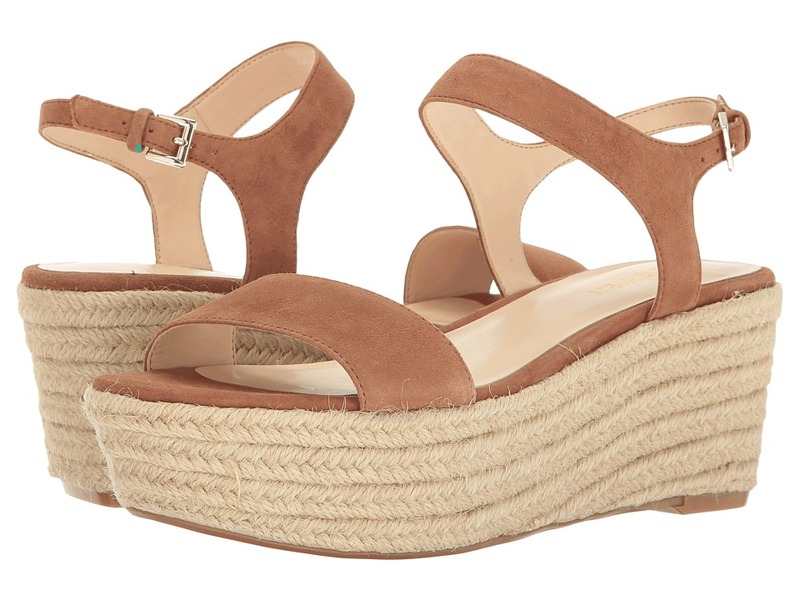 Jute-wrapped platform wedge. Man-made outsole. Imported. Measurements: Heel Height: 3 in Weight: 13 oz Platform Height: 2 in Product measurements were taken using size 8.5, width M. Please note that measurements may vary by size. Weight of footwear is based on a single item, not a pair. 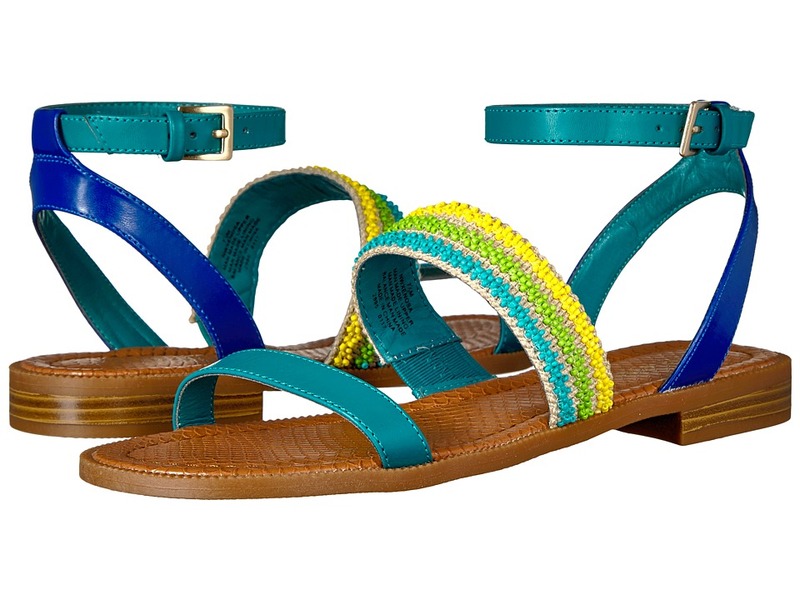 Have some fun in the sun with the trend-right Nine West Gannon 3 sandal. Synthetic upper. Wraparound ankle straps with tie-up closure and tassel details. Open toe with thong post. Man-made lining. Lightly padded footbed. Mini stacked heel. Man-made outsole. Imported. Measurements: Heel Height: 3 4 in Weight: 7 oz Product measurements were taken using size 7.5, width M. Please note that measurements may vary by size. Weight of footwear is based on a single item, not a pair. Flaunt your bold side in the eye-catching Nine West Genie sandal. Suede upper. Wraparound ankle strap with tie-up closure. Open toe. Ghillie lace-up vamp with fringed straps. Man-made lining. Lightly padded footbed. Wrapped block heel. Man-made outsole. Imported. Measurements: Heel Height: 3 in Weight: 10 oz Product measurements were taken using size 7.5, width M. Please note that measurements may vary by size. Weight of footwear is based on a single item, not a pair. 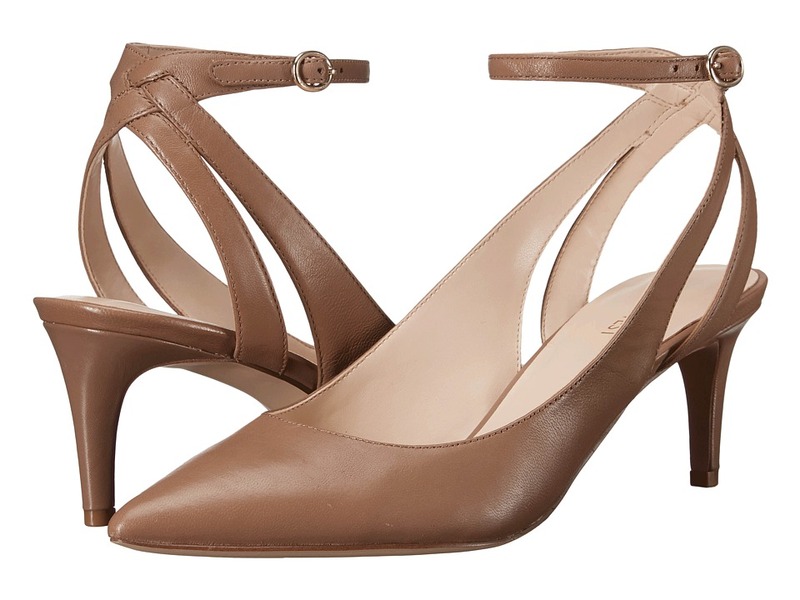 Elevate your polished workday look with the Nine West Scheila pump. Available in a variety of uppers. Slip-on design. Almond toe. Man-made lining. Lightly padded footbed. Man-made outsole. Imported. Measurements: Heel Height: 3 in Weight: 10 oz Product measurements were taken using size 8, width M. Please note that measurements may vary by size. Weight of footwear is based on a single item, not a pair. 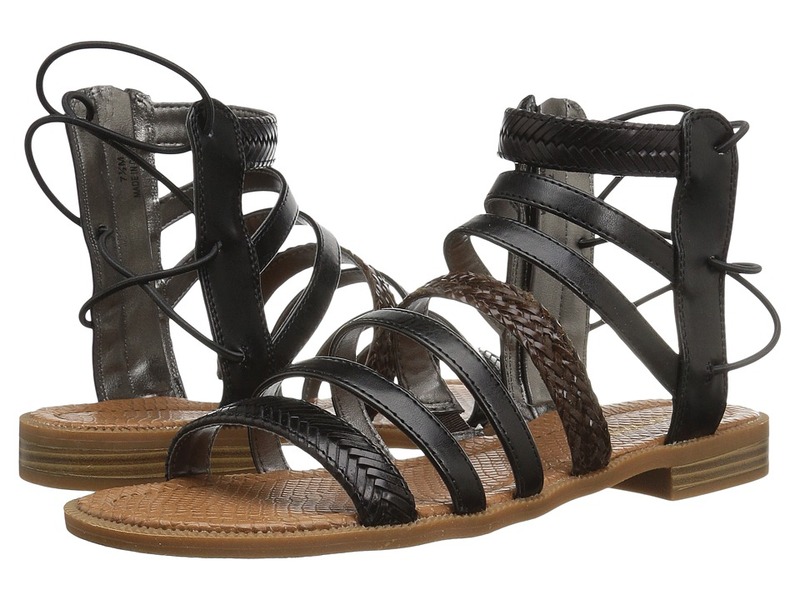 Dare to stand out from the crowd this season with the Nine West Xema 3 gladiator sandal. Leather or man-made upper. Side zippered closure. Open toe. Gladiator silhouette. Smooth and woven straps along vamp. Lace-up detailing along heel panel. Man-made lining. Lightly padded footbed. Man-made outsole. Imported. Measurements: Heel Height: 1 2 in Weight: 7 oz Product measurements were taken using size 9, width M. Please note that measurements may vary by size. Weight of footwear is based on a single item, not a pair. A timeless design with bold appeal, the Nine West Xen will garner plenty of attention. Leather upper. Back zippered closure. Open toe. Crisscrossing straps over vamp. Hook-and-loop closure at ankle cuff for added comfort. Man-made lining. Lightly padded footbed. Stacked heel. Man-made outsole. Imported. Measurements: Heel Height: 3 4 in Weight: 7.4 oz Product measurements were taken using size 7.5, width M. Please note that measurements may vary by size. Weight of footwear is based on a single item, not a pair. From desk to dinner, the Nine West Shawn pump will merit plenty of compliments. Available in a variety of uppers. Ankle strap with buckle closure. Pointed toe. Side cut-out details. Man-made lining. Lightly padded footbed. Wrapped heel. Man-made outsole. Imported. Measurements: Heel Height: 3 in Weight: 7 oz Product measurements were taken using size 9, width M. Please note that measurements may vary by size. Weight of footwear is based on a single item, not a pair. A timeless design with bold appeal, the Nine West Xen 3 will garner plenty of attention. Synthetic upper. Back zippered closure. Open toe. Crisscrossing straps over vamp. Hook-and-loop closure at ankle cuff for added comfort. Man-made lining. Lightly padded footbed. Stacked heel. Man-made outsole. Imported. Measurements: Heel Height: 3 4 in Weight: 7.6 oz Product measurements were taken using size 8, width M. Please note that measurements may vary by size. Weight of footwear is based on a single item, not a pair. 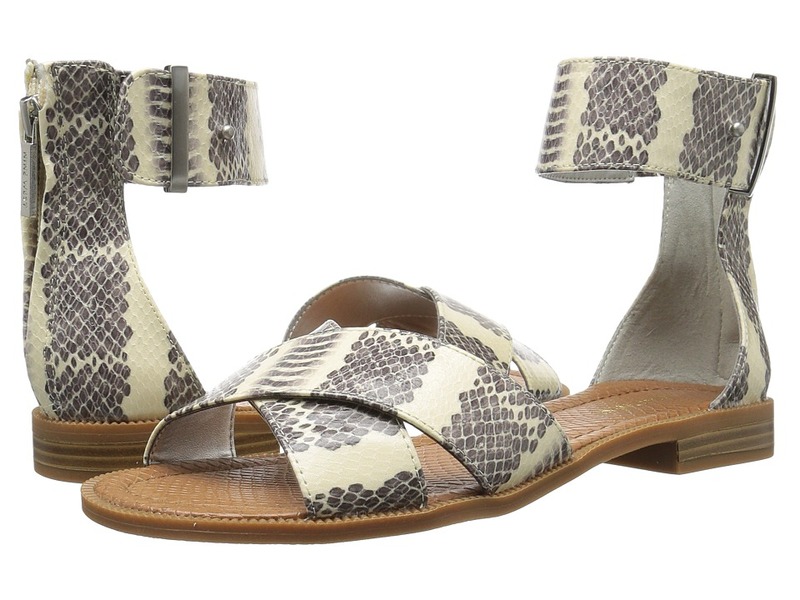 Have some fun with your chic summer style in the Nine West Xenosa 3 sandal. Multi-synthetic upper. Ankle strap with buckle closure. Open toe. Man-made lining. Lightly padded footbed. Mini stacked heel. Man-made sole. Imported. Measurements: Heel Height: 3 4 in Weight: 6.1 oz Product measurements were taken using size 8, width M. Please note that measurements may vary by size. Weight of footwear is based on a single item, not a pair. Draw in the compliments when you elevate your look with the Nine West Koolkat platform sandal. Available in a variety of uppers. Ankle strap with buckle closure. Open toe. Crisscrossing straps over vamp. Man-made lining. Lightly padded footbed. Wrapped platform and block heel. Man-made outsole. Imported. Measurements: Heel Height: 4 1 2 in Weight: 15 oz Platform Height: 1 1 2 in Product measurements were taken using size 7.5, width M. Please note that measurements may vary by size. Weight of footwear is based on a single item, not a pair. Draw in the compliments when you elevate your look with the Nine West Koolkat 3 platform sandal. Synthetic upper. Ankle strap with buckle closure. Open toe. Crisscrossing straps over vamp. Man-made lining. Lightly padded footbed. Wrapped platform and block heel. Man-made outsole. Imported. Measurements: Heel Height: 4 1 2 in Weight: 1 lb 1 oz Platform Height: 1 1 2 in Product measurements were taken using size 9, width M. Please note that measurements may vary by size. Weight of footwear is based on a single item, not a pair. You~ll be adored for your on-trend minimalist style with the Nine West Onosha sneaker. Leather or textile upper. Slip-on design. Round toe. Oversized bow detail at vamp. Textile lining. Lightly padded footbed. Synthetic sole. Imported. Measurements: Weight: 11 oz Product measurements were taken using size 7.5, width M. Please note that measurements may vary by size. Weight of footwear is based on a single item, not a pair. Put a little spring in your step with the Nine West Yannah sandal. Leather upper. Back zipper for easy entry. Open toe. Ankle cuff with adjustable button closure. Crisscrossing straps over vamp. Man-made lining. Lightly padded footbed. Stacked block heel. Man-made outsole. Imported. Measurements: Heel Height: 2 3 4 in Weight: 12 oz Product measurements were taken using size 7.5, width M. Please note that measurements may vary by size. Weight of footwear is based on a single item, not a pair.